One of the more insidious ways that anti-Israel forces lie is to take an innocuous video or picture and make up an explanation to put Israel in a bad light. The latest example appears to be a viral video of an Arab girl in Hebron climbing a fence. All the video shows is a girl climbing a fence. Something that kids do every day. There are schools surrounded by fences that kids climb for fun when they can walk around. You've probably done this yourself when you were younger. In other words, without any further evidence, we cannot believe a word of these (conflicting) explanations of what happened. And there is reason to doubt them. Because there are Arabs on both sides of the fence shown here. Clearly the original story that the house was surrounded and then the gate locked is absurd, because the story would be the people who are caught inside the fence, not the ones who are trying to go from outside in. And the people "inside" the fenced area don't seem to be acting like they have been jailed. When Israel does seal off a house, it certainly doesn't include a road. So the story morphed into "Israel closed the gate." OK, where are the photos of the people waiting at the gate, or trying to break it open, or arguing with soldiers, or anything showing that the explanation offered by the Israel-haters is true? I don't know why the girl climbed the fence, but my guess is that she simply didn't want to walk around it. That's it. That's all we can guess without any evidence to the contrary. This is not "apartheid." This video shows nothing wrong. It is all the lies that people attribute to the video that causes the hate. And they do it quite knowingly. UPDATE: An explanation was posted on Facebook by Amit Deri. The girl could have indeed walked around, there is an open section a little down the road with no gate at all. 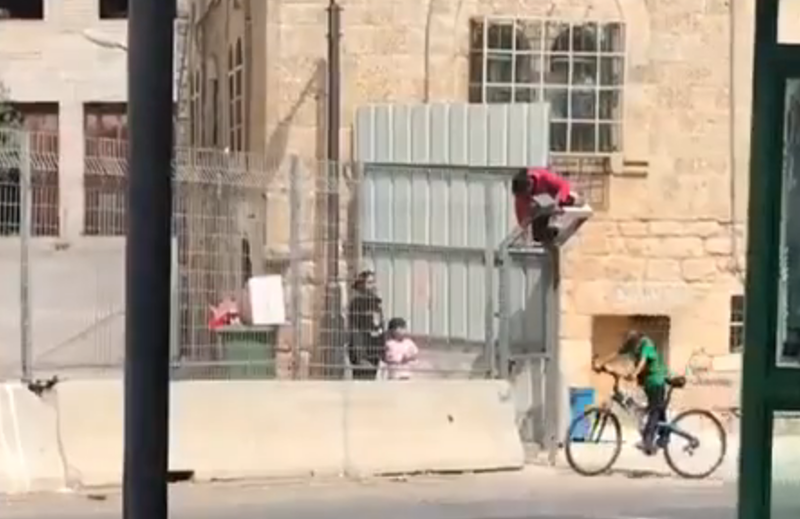 The fence she climbed was a gate that is normally open, and it was closed temporarily because Arabs were throwing stones from there. When the incident was over, the gate was opened soon after. The reason the gate exists to begin with is because of a fatal stabbing attack a few years ago.